The function below is available on CCBoot version 20180506 and above only. 1. Boot a client in super client mode and then open CCBootClient application. 2. The click on "Additional Option" button. 3. On the "Additional Option" window, check the "System Optimization" checkbox, then click "OK" button (Figure 1). 4. 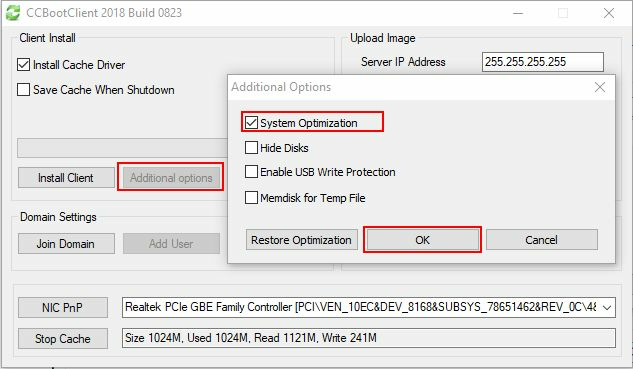 CCBoot will optimize the Windows automatically, After the process is complete, turn off the client PC and save the image. 5. The client should performance better than before. Note: The above steps is better to perform before uploading the image. This feature will disable some services like Windows Updates, Defragmentation, Windows Defender and other services which are not needed for the normal gaming PC.